Green gold was planted in Natal and flourished like a well fertilised weed. Sugar Cane, a labour intensive crop, promised to be the saviour of the British colonial conclave at Port Natal. However, the indigenous Zulu refused to perform manual labour in the sugar fields. 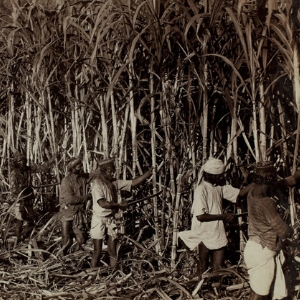 This paved the way for indentured labour from India to plant, harvest and tend the cane crops. This is their story and marks the beginning of the largest population of Indian people in one place outside of India itself. From these humble beginnings, with diligence, hard work and innate intelligence, they grew into a wealthy nation within a nation, which subsequently enhanced the cultural and fiscal fortunes of southern Africa.